TSEA Finalists Announced: Minister of Tourism, Hon Edmund Bartlett (4th L) paused for a moment with the finalists who will vie for the coveted award of national champions in the Tourism Service Excellence Awards (TSEA) on March 30. Joining Minister Bartlett are (L-R) Chairman of the TSEA Programme, Dr. Carole Guntley, Executive Director of Jamaica Vacations, Ms. Joy Roberts, Permanent Secretary in the Ministry of Tourism, Mrs. Jennifer Griffiths, Dr. Carey Wallace, Executive Director of the Tourism Enhancement Fund and Executive Director of the Tourism Product Development Company, Dr. Andrew Spencer. The occasion was the official announcement of the TSEA finalists which was held at the Spanish Court hotel on March 12, 2019. Jamaica Tourism Minister Hon. 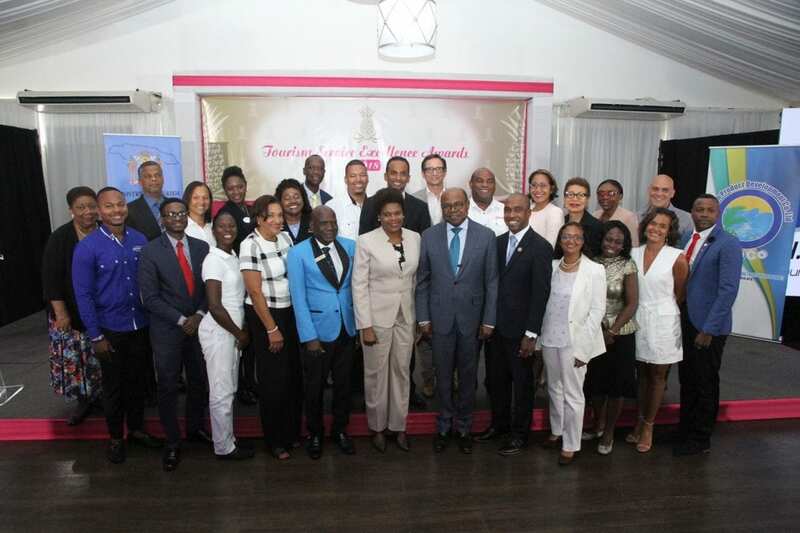 Edmund Bartlett has lauded the contribution of the finalists who will vie for the coveted award of national champions in the Tourism Service Excellence Awards (TSEA) on March 30. The TSEA, which is in its sixth staging was created by the Ministry of Tourism, and is implemented annually by the Tourism Product Development Company Limited (TPDCo). The awards seek to recognize and reward tourism entities and individuals that have consistently provided exemplary service within the tourism industry. “Sixty percent of the value of the visitor experience is service and it is because of your service to the sector we were able to last year, break another record in terms of arrivals and earnings by welcoming about 4.32Million visitors and securing approximately US3.3Billion. So Service for us is not a reference but service is what we do and in tourism, he who does it the best gets the most,” said Minister Bartlett. Nineteen finalists are set to contend for the award of national champions in the TSEA come March 30th. The finalists, ten of which represent organizations and nine, the individual category, were selected from the 6 resort areas of Jamaica. 107 nominations were received this year from the major sub-sectors of the tourism industry, from which 50 semi-finalists were shortlisted and further narrowed to decide the final 19 contenders for the major awards and prizes. Minister Bartlett added that, “Our phenomenal arrivals and earnings last year helped us to employ 120,000 people directly and another 250,000 indirectly. This enabled us to contribute close to J$450 Billion to the GDP, in fact 22% of the earnings or the revenue that went into GDP came from tourism. Minister Bartlett also underscored the importance of rewarding tourism entities and individuals for their contribution to the tourism sector and the impact they continue to have on visitors to the island, which has resulted in an impressive 42% in repeat business; this represents the highest percentage in the region. He recognized as well the importance of the service excellence awards programme which acknowledges, celebrates and showcases service. The finalists for the 2018 TSEA are Beaches Negril, The Tryall Golf & Country Club, Ultimate Freedom Bed & Breakfast, The Joy Spence Appleton Estate Rum Experience, Half Moon Hotel, Deja Resort, Miss T’s Kitchen, Jamaica Inn, VIP Attractions and El Sol Vida from the organization category and from the individual category, Shenade Quarrie of Sandals Negril, Yanike Brown of Beaches Negril, Coleen Powell- Gordon of Jakes Treasure Beach, Kingsley George Blake of Round Hill Hotel, Conroy Thompson of Half Moon Hotel, Paul Norman of Dolphin Cove Jamaica, Nardia Angus of Golden Eye, Duane Phillips of Knutsford Court Hotel and Caroline Bonner of VIP Attractions. Srilal Miththapala, senior tourism industry personality and regular contributor to eTurboNews from Sri Lanka, has been appointed to the Board of the Asian Eco-Tourism Network. When I was told that there was a thriving wine industry in Indiana – I thought it was the beginning of a riddle.